David Des Granges The Saltonstall Family c.1636–7. According to notes from the Tate: ‘The painting is thought to show Sir Richard Saltonstall (1595-1650) of Chipping Warden, near Banbury, Oxfordshire, with his family. Read more notes from the Tate. It seems apt after the last post concerning the word peace and related pacifist to highlight the enthusiasm of my grade 7 class for the poetry of Wilfred Owen. Owen’s writing highlights the horror and despair of war in the trenches. Students learned by heart one of Owen’s poems, an art faded from fashion in the classroom these days. You’ll note, discerning reader, that I did not say memorize or rote learn. I really hoped students would be caught in the web of words, to feel and be aware of the emotion or atmosphere built by the poet. I wanted them to go beyond a ‘da-dum, da-dum’ monotonous reading, go beyond rote memorization, rather take their poem to heart. Inevitably we examined the word futility, the title of one of Owen’s poems. Establishing the morphemes was at this stage of the year relatively straightforward with two hypothesises <fute+ile+ity> and <futile+ity>. We confirmed the suffix’-ile’ by the words: senile, virile, ductile, fragile. Both fragile and ductile helped us to see that this indeed was a suffix. We understood that the ‘-ile’ in fragile could be substituted by ‘-ment’ and that in ductile the -ile could be removed to produce a free base element ‘duct ‘. 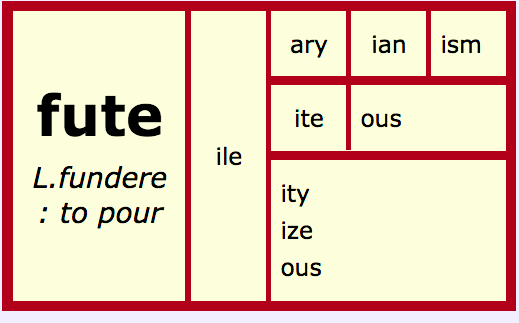 We knew that the final, non-syllabic ‘e’ in our hypothesized base ‘fute’ is removed by the vowel suffix ‘-ile’. Futile, we discovered entered English in 1575 although it is not certain whether this was via Middle French or a directly from Latin futilis which meant ‘vain, worthless, useless’, a figurative sense of ‘pouring out easily, easily poured’. Futility took a little longer to be used in writing – attested in 1623, just six years before the painting above. Latin fūtilis according to the O.E.D. meant ”that easily pours out, leaky’. This Latin etymon came from the Latin infinitve fundĕre to pour out. And this is where the rather small ‘fute’ family becomes interesting. We recognized it would not be ‘wrong’ to analyze the word futile as ‘futile’ , a free base, as the others in the immediate family build on this stem. However, we are now prepared with the analysis of ‘fute’ as a bound base element, for any new word to English that sheds the ‘-ile’ suffix! Perhaps an action will one day be regarded as futous. I enjoyed the discovery of the obsolete or rare futilitous as used in 1765 by Lawrence Sterne in the hilarious Life of Tristram Shandy VIII. xiii. 36 ‘Love is..one of the most Agitating Bewitching..Futilitous..of all human passions.‘ While futilitous might have faded from the English lexicon, I see a small gap where perhaps futous may creep in! However, this is not the family in its entirety. Regard the profusion of relatives below.Note the pouring , casting, scattering sense inherent in all members of the family. The family ‘fute’ belongs to a wider family from Latin fundĕre-fusus: to pour, cast metals, scatter, rout. The Latin infinitive fundĕre and the fourth principal part fusus, alert us to the possibility of a twin base element as in confound~confusion. So ‘fute’, ‘found’,’fuse’ ‘fund’,’font’,’fond’ and ‘funnel’ are the bases derived from this root. All the words above, as the individuals within any family, carry their own stories. Refusenik is perhaps the newest to the family from Russian otkaznik , a Jew who was refused permission to emigrate, particularly to Isreal (1970 or earlier), from otkazat′ to refuse (Old Russian ot″kazati ) (O.E.D.). The Russian has been ‘partially translated’ (Online Etymology Dictionary) so that the verb ‘otkazat′ is replaced by the English refuse. It has now broadened to any person who refuses to do something, especially as a form of protest. Examining the individual is interesting, but when the whole family is assembled and viewed together in a group shot or portrait, you glean greater insight and can discern the family traits. The Saltonstall family above is interesting, two children, a baby likely to a second wife, all while acknowledging the first wife who is perhaps represented dead but approving in the bed. I am intrigued by the way the past is recognized and connects in the present in this portrait. This family portrait was painted around the same time as the word futility had first been attested in England, a mere twelve years later. Would the young Saltonstall children or their parents have used the word futility? Would the first wife have thought futile this display of her presence, recumbent in bed, appearing to give her benign blessing to the continuance of family? Below student’s poetry inspired by Wilfred Owen and their videos using images of World War One. Caught up in their vile sleep. In the thick green light. Until those dreams become reality. They see their friends dying as cattle. that they limp to safety. They say their final goodbyes. A frantic week with a light hearted meeting of city states out on the field in an Olympian contest! While it may have been light hearted competition on the field, in the classroom the wrestling was in earnest as students tackled roots written in Greek and used this knowledge of the root to confirm hypotheses as to the morphemes. How do you determine the base element? Students examined a group of words they were told are related. They were informed that each group is a family so there are members that share a base element. So far so good, somewhat familiar at this stage of the year. However, families share the same root but may have different bases! New information!! 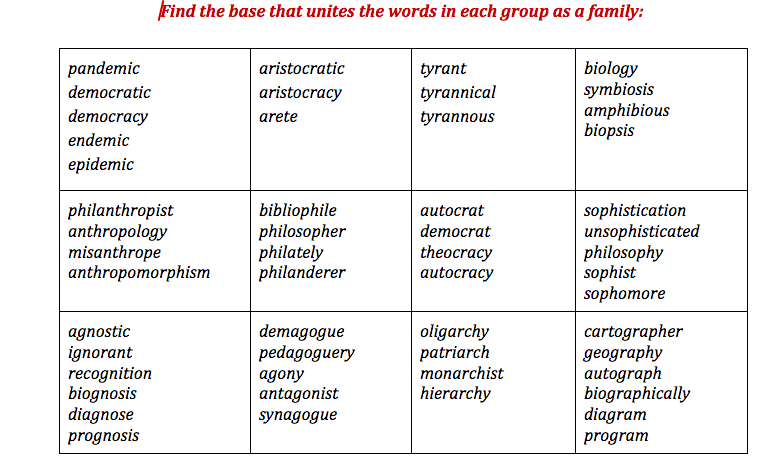 Students quickly spotted the fact that many of the words in their ‘family’ are compounds so there are two or more bases. The challenge then became one of analyzing each word into its morphemes as a word sum and to identify the related bases . Dear reader, can you do this? Base elements were discussed, hypotheses formed and revised and finally the bases in common were agreed upon based on the evidence students had before them. At this stage we did not use dictionaries or go online, just stuck with what was already there. The next stage was to identify the ‘family root’. Here’s what they were given. I hear your gasps- good grief it’s Greek!! How did these neophyte word nerds handle this task? Well, with the help of a copy of the Greek alphabet, upper and lower cases and a sheet on transcribing the Greek alphabet to the more familiar Roman alphabet courtesy of Real Spelling (Toolkit Real Spelling 3B and 4C). Too difficult? Absolutely not- mostly there was laughing and some mutterings that it was hard. However, no-one one wanted to give up: the short videos below bear witness to the students persistence, determination, enjoyment and learning. From here it was using our knowledge of the root to confirm our hypotheses of morphemes. Is there a final non syllabic <e> in the base element connected with democracy: <dem> or <deme>? Is <en-> a prefix in energy? What is the base element here? What are related words? Words are related through common bases and a common root. Words have a story to tell of their journey into English and once in English they continue to be shaped. The coining of a word is reflective of the culture of origin, as well as reflective of the time and culture when the word enters English. Some roots have produced many base elements and therefore many related words, some only one base and far fewer words. Through this continuing inquiry into Greek roots and bases students are beginning to grasp the etymological ‘diving stick’ and are discovering the biodiversity in the forest of English words. The year has begun with a crop of fresh faced students who after this week’s word work hover on the brink of word nerdery! As we begin our explorations into Greek mythology what better place to begin word inquiry than with an examination of phobias that have their roots in the language of the noble Greeks? 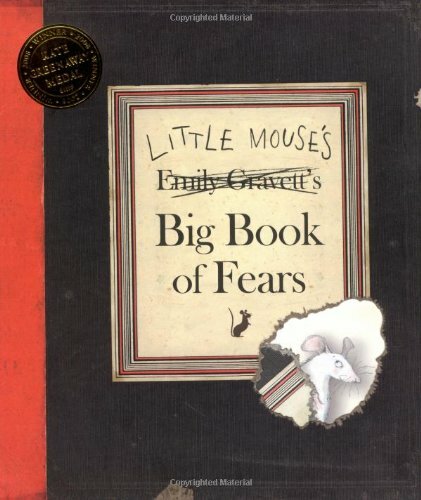 We covered the board in a flurry of phobias gleaned from the brilliantly illustrated book Little Mouse’s Big Book of Fears by the talented British illustrator author Emily Gravett. 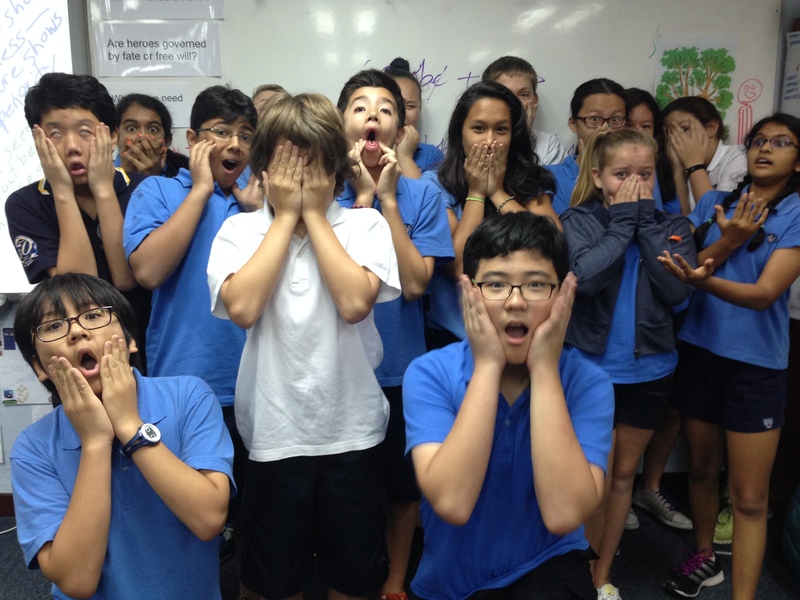 Students immediately recognized the word phobia as fear and deduced the words on the board were indicating specific fears. We began by analyzing the word phobia into <phob(e)+ia>. We confirmed the existence of <-ia> as a suffix as students suggested the words: mania, media,and hysteria. We recognized that the <-ia> suffix could be substituted in <phob(e)+ia> by another suffix, <-ic> to produce the word <phob(e)+ic>. Students were allocated a phobia to analyze into morphemes and challenged to uncover the root and its meaning. And ladies and gentlemen, they were off and fossicking in the online etymology dictionary and the O.E.D. undaunted by the fact that the entire phobia in some cases was not listed! Students used what they knew from the Greek myths we have been reading- Arachne- forever ‘woven’ into the word arachnophobia: <arachn+o+phob(e)+ia>. Students used the base element with another morphemic element, the connecting vowel letter <o> to search for the roots and they covered the board with their enthusiastic discoveries! We discovered that the word phobia, a noun, entered English in the late 18th century, with the sense of ‘irrational fear, horror, aversion”: ϕοβία. The O.E.D. informed us that <-ia> was “in Greek esp. frequent as the ending of abstract nouns from adjs. in -ος, etc.’ We found also mention of phobia as a ‘word forming element’ in both Online Etymology Dictionary and the O.E.D. We discussed the vagueness of the term ‘combining form’, a term sprinkled unhelpfully throughout all the best dictionaries. The term ‘combining form’ is not particular helpful as it lacks morphological specificity.We were certain that the dictionaries we checked were referring to the coining of so many words, so many fears all attached to phobia. We too recognized the proliferation of words attached to phobia, a productive element indeed, but rather than use the vague term ‘combining form’, we referred to these words as compound: two or more base elements in the one word. 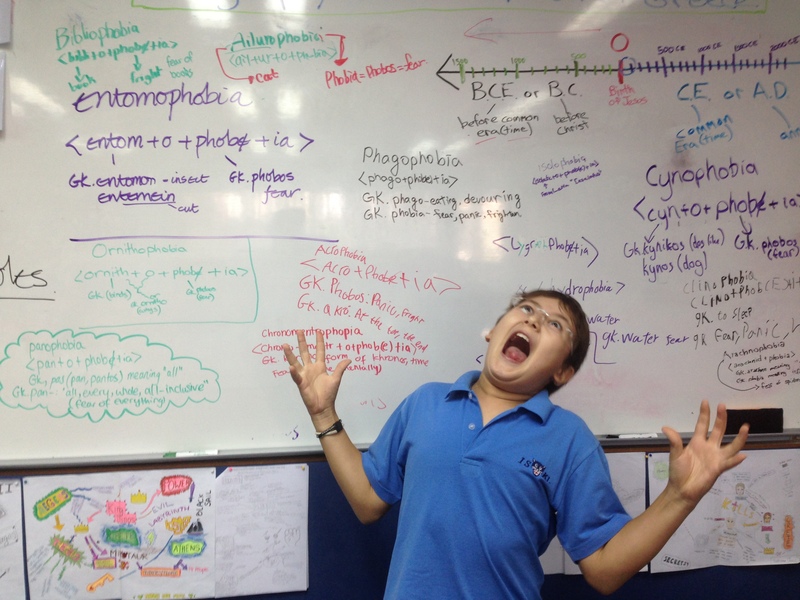 This was a surprising discovery for many students that a compound word is not simply a word with two free base elements such as whiteboard but is a word with two or more base elements which can be bound such as: <phag(e)+o+phob(e)+ia> –> phagophobia, fear of eating, or even a three base element word as one student discovered in the word kinemortophobia: <kine+mort+o+phob(e)+ia> yes, horror of horrors, fear of zombies! 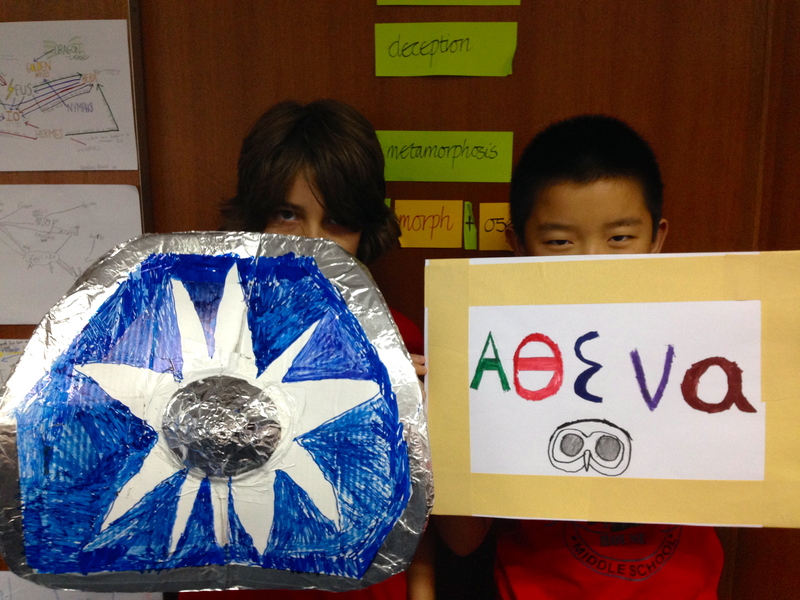 Once students had listed all their words I asked them to identify features that a word is of Greek origin. To do this we considered graphemes and elements. This work is ongoing as we gather data beyond phobias! What was discovered through this inquiry? <ph> is a digraph that represents the phoneme/f/. It always indicates that the word’s roots are Greek in origin: photograph, metamorphosis,phagophobia. Nouns in Greek often had an element <-os>. Is this a Greek suffix many wondered? Removing this from the etymon helped us to determine the base element. We saw xen(os), ξένος ,is the Greek root meaning stranger, guest, foreigner, refugee. ϕόβος, Greek phob(os) is fear, panic, terror; Greek αἴλουρος, ailur(os) is cat. Greek verbs have an element <-ein> as in Greek verb : kinein to move. Removing the <-ein> from the etymon helped us to confirm the base element. Many of the phobia words were coined in the late nineteenth and twentieth century- the earliest word we found however, was hydrophobia . This had derived from Greek ὑδροϕοβία :hydrophobia from hydrophobos :ὑδροϕόβος, which moved into Latin as hydrophobia then entering English initially as idroforbia in the late 14th century. In all cases it referred to a symptom of rabies. : ‘1547 A. Borde Breuiary of Helthe i. f. Cxliv, Hidroforbia..is abhorringe of water… This impediment doth come..of a melancoly humour’. This word probably became the basis for subsequent words formed in English. We loved the discovery that the Old English counterpart of this word was :wæterfyrhtness, frightness of water! We recognized that an internal <y> in a word is frequently a sign of Greek origin as in hydrophobia and cynophobia : <cyn+o+phob(e)+ia> from Greek κύων (κυν-) kyon: dog. We noted that the digraph <ch> when used to represent/k/ was an indication of Greek-ness: arachnophobia, chorus, choir. We discussed the term ‘hybrid’ in reference to words that draw on roots from two different languages such as claustrophobia which draws on Greek phobos and Latin claudere a root leading to many bases in English including the bound base element <claustr> here in <claustr+o+phob(e)+ia>. This word was coined by Dr. Benjamin Ball in 1879. Below images reflecting student morphological hypotheses with their research into roots. Interesting to note who has inserted a final non syllabic <e>. This will be an important inquiry in the next few weeks. It is interesting to note that not all have come to terms with the separate morpheme- the connecting vowel <o>. This will be experienced again in further inquiries into words of Greek origin. Further forays into the words that define phobia: fear, terror and panic (read Online Etymology Dictionary here to discover the Greek mythical connections of panic) as we journey with Odysseus admiring his courage in the face of fearsome monsters and his stalwart resolve to return home. Further forays into the identification of the features of words Greek in origin. And yes still to come- Tiny Tales of Fear! What a formidable group of neophyte word nerds! Should ‘e’ Stay or Should ‘e’ Go? I discovered this image when I stumbled upon a site” Funny shirts for Science Geeks”. Check this out and, given the previous post and the title of this blog, I love the nerd shirt! Should <e> stay, or should <e> go? This was the question that sparked an inquiry, ‘The Case of the Disappearing <e>’ during the week with grade 7s. Our task, to investigate a series of words, some free base elements and some stems. A stem is a base element with another bound element attached and to which you are adding another suffix or prefix such as ‘replay’( stem: prefix +base) +ing) We then considered the effect of a suffix on these words. Sometimes the <e> disappeared when adding a suffix, yet in other words, the <e> remained. Was there a consistent pattern ? Could the students come up with a clear, concise hypothesis that accounted for this? Could they then translate this hypothesis to a flow chart? Students were asked to analyze words into morphemes. 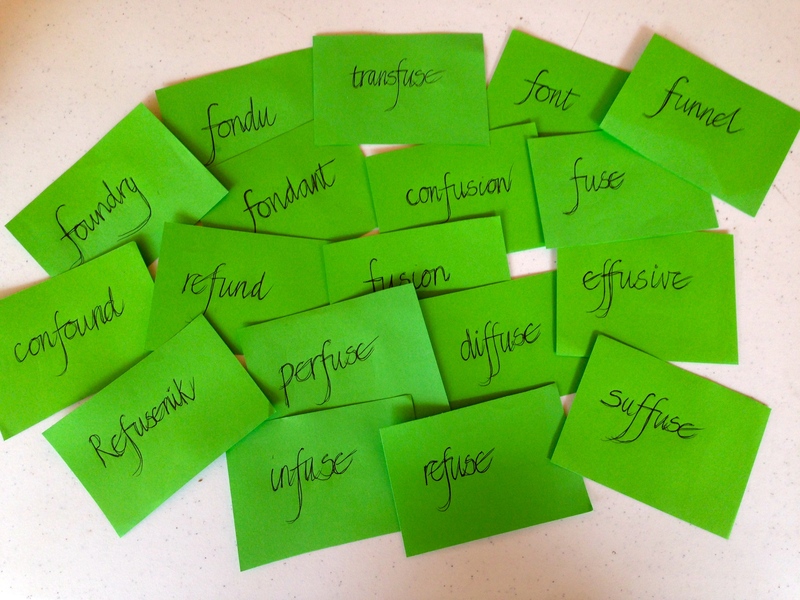 This was a challenging exercise in itself as these students, new to morphology, peeled off the affixes. They used the charts on their table to do this. I find the use of a prefix chart from Real Spelling and a suffix chart that previous classes have helped to compile, a useful springboard for students as they plunge into the heady waters of morphology. Our suffix chart is by no means complete and students must examine the possibility of the existence of a suffix by confirming it with other words sharing this. This stage of ‘the case’ took several days. It was homework as I asked students to think about one word. ‘This is what i think the word sum is. What if I said the word <action> What would the suffix there be? and peel back the suffixes from the word <elongate>? I am pleased that this student has ‘had a go’, but hope to see him expressing more justification and backing up his theory with evidence for each morpheme as the year and inquiries into words progress. New for many students was the suffix <–ate> which they discovered when asked to check whether inspiration could be analyzed as <*in+ spire+at+ion> or <in+spire+a+tion>. Many students were surprised that <*tion> was not a suffix. They could think of examples where this letter string occurred but when asked how they could account for this in the word <action>, their eyes widened as they realized where the morphemic boundaries lay! I adapted a flow chart from Real Spelling by removing all text except for the words START,” “Yes” , “No” and the final boxes “Just add the suffix”, and “Replace the single silent <e> with the suffix.” This <e> often referred to as ‘silent’, is non-syllabic, always final in a base, and also in some suffixes. Sadly, these videos all too often reveal that I still need to remain silent longer in order to “hear” and understand a student response, as well as develop a steadier hand – less of the Blair Witch Project hand held camera effect!. While this public exposure can be confronting, I find this recording of students extremely helpful. This has allowed me to reflect on the questions I ask of students and has assisted removing the tendency to rescue or overwhelm my students with a tsunami of information. I have learned to be patient and allow more time for cognitive struggle. Students develop more pride in their efforts when given time to reflect and justify rather than give out the answer but the balance is fine- too much time and interest wanes, too little time and students become dependent on the right answer rather learning the habits of persistence and data gathering to support an hypothesis. This was challenging for all students from the most competent (or those whose writing appears error free) to those who need to internalize this pattern in their writing. Just because writing is error free, does this mean that students understand and justify the why of an orthographic pattern or convention? This understanding and analysis of patterns and conventions is exactly what those who are new to English seek in coming to grips with the English language. This too is exactly what those students whose writing appears to be filled with miscues need to understand. Too often these students are misled by mnemonics and half truths purporting to be rules. All too often students are told rules rather than challenged to investigate, gather and analyze data they have amassed. All too often we “tell” students rather than allow the time to explore. All too often we rush this stage rather than give them time for this to settle and allow for reflection and refinement of their ideas. In reference to word inquiry and this investigation by grade 7, I take heed of Piglucci’s warning and have taken the liberty of slightly adapting this: “There is no shortcut for a serious investigation of a word, including the spelling out of our auxiliary, and often unexplored, hypotheses and assumptions.” This is the basis of word inquiry- serious investigation and questioning of hypotheses with data and evidence. ‘Foolery, sir, does walk about the orb like the sun, it shines everywhere’. The header image of this new blog is a detail of a print by my father John Madsen after an illuminated Flemish manuscript image of fools, 1340. The exuberant cavortings of these figures in the blog header and the studious reflection in the sketch above, is a hopeful symbol of the atmosphere involved in this grade 7 class and represents the joy of critical thought, as when we are engaged in word inquiry. As this blog is entitled Word Nerdery, I asked my humanities classes about the words ‘nerds’ and ‘geeks’. What was the difference between the two? Which word was more negative? 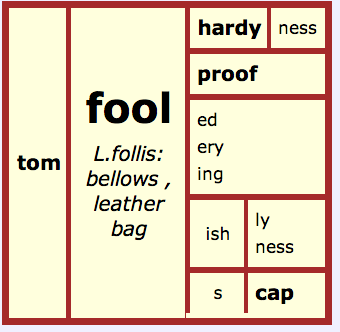 We also considered the word ‘fool’ as this is an underlying concept in both words. Despite the laughter when introducing these words, this investigation raised interesting points about synonyms in English. We understood that when a word is totally identical in meaning, one of the words will become obsolete or shift in meaning. Synonyms range along a continuum of closeness. While we noted many similarities between the words, we too were aware of slight differences. Both terms ‘geek‘ and ‘nerd’ suggest knowledge, but geeks perhaps are more obsessively narrow in their knowledge. Both nerds and geeks are socially awkward, according to my students, but nerds possibly more so; geeks are more technologically savvy, while nerds more academic. Nerds lack a sense of style – many students referred to the stereotypical braces (suspenders), pants pulled a little too high,tie, and glasses. 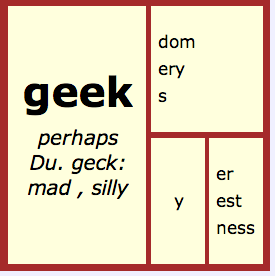 Both groups felt that the word ‘geek’ to be somewhat more positive in connotation. After listing the features of ‘nerd’ and ‘geek’, we then consulted our resources – the trusty Mac dictionary, OED, Chambers Dictionary and Online Etymology Dictionary, in order to investigate the denotation and etymology. The OED gives the denotation that a fool is: ‘One deficient in judgement or sense, one who acts or behaves stupidly, a silly person, a simpleton. (In Biblical use applied to vicious or impious persons.) The word has in modern English a much stronger sense than it had at an earlier period; it has now an implication of insulting contempt which does not in the same degree belong to any of its synonyms, or to the derivative foolish. Cf. French sot’. The Online Etymology Dictionary discussed the later development of the professional fool in the 14th century as jester or court clown although noting that it is difficult to determine whether it was an entertainer or an ‘amusing lunatic on the payroll’. And yes ‘folly‘ comes from from this root as does ‘follicle’ so Latin root follis has led to two base elements in PDE (Present Day English): <fool> and <fol>. Another fascinating discovery was the word ‘foolscap’ and this was the literal meaning- a cap worn by the fool or the court jester in the 1630s. However as we saw in Online Etymology Dictionary in the 1700s it became associated with a type of paper which was watermarked with a court jester’s cap! The OED provided this denotation: ‘An insignificant, foolish, or socially inept person: a person who is boringly conventional or studious. Now also:Spec. A person who pursues an unfashionable an unfashionable or highly technical interest with obsessive or exclusive dedication’. We discovered the connection to Dr. Seuss in the etymological entries of both dictionaries and then confirmed this with Online Etymology dictionary. We discovered that ‘geek’ is the older of the two words. We discussed society’s view of knowledge and learning or enthusiasm for learning. Why is it, as these words suggest, an object of derision and scorn? The words imply that if you show an enthusiasm for learning, or a passion for a particular area, you are foolish, socially awkward and lack a sense of fashion!When recently browsing through Idioms and Their Origins by Roger and Linda Flavell, I chanced on the expression ‘bluestocking’ to discover how this too is a derogatory term to deride ‘erudite’ women. The Della Calza society, meaning ‘of the stocking’, was formed in 1400 in Venice by learned men and women with blue stockings as their emblem. This was imitated in 1590 by the Bas-bleu club in Paris which proved a hit with learned women. In London, in 1750 Lady Montgomery ‘tired of the trivial round of cards and gossip’ invited intellectuals and literary figures to her house for discussion. One member of this group Benjamin Stillingfleet often wore blue worsted stockings rather than black silk and so this feature was seized upon to label and deride the group. Yet another case of of public contempt and mockery of learning. From this discussion about negative attitudes to learning, we discussed the word stereotype and the dangers of this type of categorisation. We had just made identity charts of ourselves and had been struck by the diversity in interests, religions, places lived, and cultures that had influenced and shaped us. We know that humans are complex and more than one solitary aspect such as race or religion or gender or the fact that we love reading or learning. We also discovered, as my students had sensed, that the word ‘geek’ is shifting from a negative and harsh categorising of people to becoming more positive. This process is known as amelioration. ‘Geek’ started to ameliorate in the 1990s as, we conjectured, society became dependent upon the technological knowledge and wizardry of geeks. After researching the etymologies of these words, students divided into groups to build matrices of the words ‘geek’, ‘nerd’ and ‘fool’. the terms ‘free’ and ‘bound’ base elements. All students were able to identify that these words under investigation were free base elements. to use resources to gather information. We read several dictionary denotations which added to our understanding of the words. We saw where to find the etymological information in the dictionary entries as well began to understand how to find the root in the Online Etymology Dictionary. that words have stories and a history. Students are beginning to understand the term root. that words can change over time. Meaning can shift as language evolves and adapts to societal change. Words can shift from negative connotations and become positive and likewise slip to become more negative- we saw this process of shift in the status of ‘geek’ and ‘fool’. that bound elements, prefixes and suffixes, can be attached to a base or another suffix to form adjectives, nouns, verbs, adverbs that share the same base. We realized that compound words have two base elements. In the case of ‘foolproof’ or ‘tomfoolery’ both elements are free. that synonyms are not interchangeable. There are subtle differences of meaning as we saw with all three words. We felt ‘fool’ to be the most negative followed by nerd and geek more positive. So theses are the first steps in word inquiry and I am hopeful that this new crop of grade 7 students will thrive in their thinking and research about words and take pride in being ‘word nerds’. And to be absolutely clear about ‘geek’ and its current moves to a more positive connotation, look at the poster below one student found in his ‘geek’ inquiry. Further fascinating reading about famous fools such as Tarlton, jester to Elizabeth I (r. 1558-1603); Will Sommers, court jester to Henry the V111; a dwarf-jester called Nai Teh (Mr. Little) at the court of King Mongkut of Siam (r. 1851-68), described by Anna Leonowens in Anna and the King of Siam; Jamie Fleeman (1713-78), the Scottish jester to the laird of Udny who ‘complemented his jesting duties with those of a cowherd and goose guardian.’All these and more can be found here: Fools Are Everywhere, by Beatrice Otto.